The project scope was to perform the data analysis and migration of all HCM data (HR and Payroll) from a Ceridian system and financial data from an Oracle EBS R12 system into Workday for a $2.2B airport/transportation management firm based in Arlington, VA. The client implemented Workday to consolidate their HCM and Financial business operations which were operating in separate systems; Ceridian and Oracle EBS R12, respectively. A key limitations was that legacy Ceridian system offered little transparency, versatility, and reporting abilities to support business needs. The client had a number of concerns regarding their data migration. Premier worked with the organization to address these concerns, ensuring a successful and on-time Workday implementation. Lack of knowledge of the legacy Ceridian system and the quality of the data therein. Lack of experience of target Workday system requirements. Created meaningful reports to help the client better understand their legacy data and identify legacy data issues. Worked with the client to develop a data quality strategy to address legacy data issues, either by data cleanup or data translation rules applied during conversion. Implemented programmatic data cleansing, such as employee and dependent address standardization, to ensure incomplete or bad data was corrected prior to Workday go-live. Created validation reports tailored to Workday’s requirements for each individual data piece, allowing the client to address invalid data or missing Workday configuration prior to loading the data. Developed conversion error reports which allowed the client to identify legacy system issues, such as invalid, missing, or duplicate data. This enabled the client to address these issues early, a benefit as there is little ability to back data out of Workday once loaded. Produced data load files in the exact format that Workday required, with embedded XML encoding, as well as any special field formatting rules required. Produced reporting tools which allowed the client to fully validate converted historical payroll data, with payroll metrics such as Gross Wages, Net Pay, etc., tied-out to the penny. Built a complete gross-to-net payroll reconciliation tool that allowed the client to reconcile every line from every paycheck for every employee. This report exceeded the standard Workday version because it was customized to meet their exact needs, displaying Ceridian’s payroll data alongside Workday’s. Provided the client with complete visibility to potential payroll issues, helping them identify error patterns and correct issues at a systemic as well as employee level before go-live. Used Applaud’s extraction capabilities to extract the raw data from the legacy systems into Applaud’s data repository. Utilized Applaud’s automated profiling on each relevant column in every one of the legacy systems to assist with the creation of the data conversion requirements. Deployed Applaud’s integrated analytics/reporting tools to perform deeper analysis on the legacy data to identify numerous legacy data issues as well as Workday-specific validations, identifying missing or invalid configuration prior to loads. Leveraged Applaud’s ability to develop custom payroll reconciliation reports, allowing the client to compare every line of every paycheck, represented to the business in a meaningful way. Leveraged Applaud’s flexibility to create import files in any format required by the target system, including XML files with embedded encoding. Used Applaud’s data transformation capabilities to quickly build out easily repeatable data migration programs and to quickly react to every specification change. Employed experienced data migration consultants to identify, prevent, and resolve problems before they became issues. To help overcome the expected data migration challenges, the organization engaged Premier International’s Applaud® data migration Services. Premier’s data migration consultants: Premier’s services group averages more than eight years of experience working with Applaud, exclusively on data migration projects. Premier’s methodology: Premier’s EPACTL approach to data migration projects is different than traditional ETL approaches and helps ensure the project stays on track. This methodology decreases overall implementation time and reduces the risk of the migration. 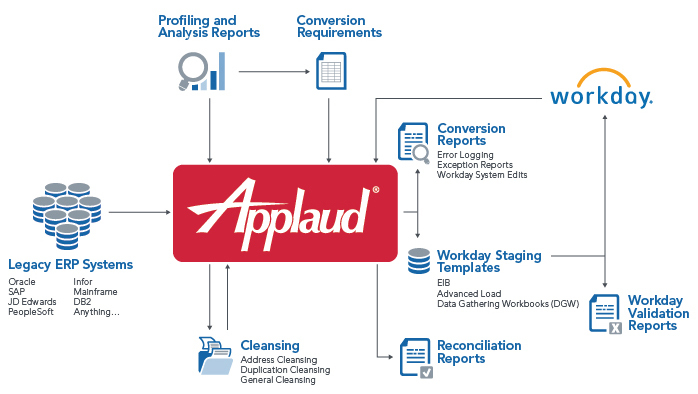 Premier’s data migration software, Applaud®: Applaud was built from the ground up to address the challenges that occur on data migration projects, allowing the team to accomplish all data needs using one integrated product. The combined aspects of the Applaud solution were leveraged to meet the challenges of this project. Bringing Premier into the project drastically reduced the risk of failure. The end result of using Applaud data migration services was a successful implementation. With 100% of converted records successfully loaded, the business could begin running HR business processes in Workday right away. In addition, with a 100% successful historical payroll data conversion and a payroll reconciliation that compared every line of every paycheck and provided exhaustive variance reports, the client began payroll processing in Workday immediately, confident that their data was accurate.